We use various herbs as natural remedies for many ailments, disorders, and diseases. Sometimes, we may also have additional benefits by combining two or more herbs. To expand on this theory, we will discuss the health benefits of echinacea and goldenseal on their own and when combined. They can be found as main ingredients in many supplements, while at the same time, there are cautions as to the lack of scientific evidence on their combined use. Let’s look at the health benefits of echinacea and goldenseal, as well as their uses. Echinacea has been referred to as a miracle plant as it is used to treat everything from the common cold to major infections. The plant is native to regions of the United States, Canada, and Europe. The entire plant can be used for medicinal purposes as it contains different beneficial components in the roots, as well as in the upper portion of the plant. Echinacea may help to boost the immune system as well as relieve pain and inflammation issues. It contains antioxidant, antiviral, and hormonal properties to combat infections, hay fever, sinusitis, and even athlete’s foot. It may also reduce healing time as it helps treat wounds and sores with its antiseptic components. The most popular and most common use of echinacea is to help prevent and fight the common cold. The United States Department of Agriculture Natural Resources Conservation Service states that using 10 milligrams of echinacea for each kilogram of body weight may boost the immune system. The effects may be beneficial in the prevention of cold symptoms but have been noted to be more effective in treating the symptoms once they appear. The Native Americans first used echinacea to alleviate pain from various areas of the body. It has been used to treat headaches and sore throats, as well as for pain relief from measles, herpes, gonorrhea, tonsillitis, and the stomach and bowels. The method of use is commonly drinking it as a tea, but it can also be ground into a paste and rubbed onto the affected area. Its effective use on settling stomach and bowel pain extends into treating the gastrointestinal tract. It may relax and calm tense and tight muscles to provide a natural solution to treat constipation. You can use it in a tea form for both acute and chronic situations. Since inflammation is present with many serious health conditions such as uveitis and rheumatoid arthritis, echinacea may be a key factor in treating this and other conditions. Since its traditional use by Native Americans, echinacea has been combating skin conditions such as eczema, psoriasis, insect stings and bites, and even infections. Some patients with anxiety, depression, and attention deficit hyperactivity disorder (ADHD) have benefited from using echinacea as a natural treatment for symptoms. It is recommended not to use more than 20 milligrams for each dose. Due to its anti-inflammatory properties, you may have suspected that echinacea is a great way to combat upper respiratory conditions aside from just the common cold. While it also boosts the immune system, this herb may also treat influenza cases, croup, strep throat, whooping cough, and tuberculosis. 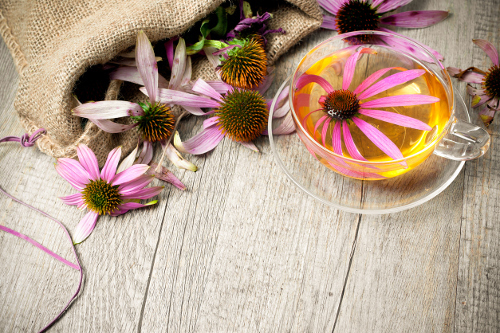 Echinacea is a powerful tool in fighting various infections throughout the body including urinary tract infections, genital herpes, vaginal yeast infections, bloodstream infections, and gum disease. The earliest documented use of the goldenseal plant is thought to be by the Iroquois and Cherokee tribes to treat stomach ailments, canker sores, and cancer. This flowering plant is native to the region east of the Mississippi River. The palm-shaped leaves are not recommended for consumption, and the root is used for all medicinal purposes. It has alkaloids of berberine, hydrastine, and canadine with powerful astringent effects. While it is used for the treatment of skin conditions, digestive issues, infections, and pneumonia, it is also used with other herbs. The most beneficial combination is with echinacea, as the two plants complement and stimulate chemical components in each other. Let’s learn what goldenseal is good for on its own. The goldenseal plant is used to help the digestive tract by promoting appetite and bile secretion. It has properties to treat and possibly prevent cases of gastritis, ulcers, bowel issues, ulcerative colitis, and intestinal gas. Like echinacea, goldenseal has natural components to boost the immune system and combat the common cold, flu, and allergies. These herbs together are a powerful combination of an antigen-specific antibody mix. Goldenseal is currently being studied in various research programs as a possible cancer fighter. It has berberine which helps to target cells and induce the cell cycle arrest. It has been successful in destroying harmful cells in rat studies. Goldenseal is used as a natural antibacterial and anti-inflammatory agent to treat gum problems, sore throats, canker sores, and conjunctivitis, known as pink eye. It is found as an ingredient in mouthwash and eyewash solutions. Goldenseal has berberine which is used to treat heart issues such as arrhythmias and heart failure. By regulating bad cholesterol found in the liver and reducing plasma cholesterol, goldenseal may work to keep the heart healthy. It works to regulate the blood sugar levels and promotes good blood circulation with low blood pressure and the opening of arteries. Goldenseal targets the mucous membranes to assist with the treatment of infections and inflammation of canker sores, urinary tract infections, diarrhea, and vaginitis. It has astringent and antimicrobial components that soothe, protect, and nourish the membranes. While echinacea and goldenseal can be most beneficial together, they do come with their own side effects. A combination with prescribed medication must also be taken into consideration. When taking the two together, you should know if the side effects outweigh the goldenseal and echinacea benefits. The most common side effect is uterus contractions, which is why this natural herb is not recommended during pregnancy. Large doses of goldenseal may cause nausea, difficulty with breathing, muscle spasms, and damage to the nervous system. Taking goldenseal over a prolonged period may also damage the gastrointestinal tract, resulting in bouts of diarrhea, chronic constipation, and increased stress levels. It may also cause hallucinations. Any form of echinacea is beneficial for up to the first 10 days of consumption. It is intended for short-term use. The side effects of using too much or for longer periods of time include headaches, fever, sore throat, abdominal pain, nausea, vomiting, dizziness, insomnia, muscle pain, joint pain, confusion, and possibly numbness of the tongue. Direct application to the skin may result in a rash and itchy patches. Goldenseal and echinacea are two of the more popular herbs to use as a medical remedy for many ailments. Since they have common components that combat similar conditions, many times they are used together to promote quicker healing. But, be sure to avoid possible overuse of either one. Even natural plants can contain chemical properties that may interfere with the benefits of prescribed medications and the combination of herbs. Sanelli, D., “Health Benefits of Echinacea & Goldenseal,” Primo Health Coach, April 17, 2015; http://blog.primohealthcoach.com/echinacea-goldenseal, last accessed June 12, 2017. Rogers, J., “Goldenseal Benefits and Side Effects,” Natural Alternative Remedy; http://www.naturalalternativeremedy.com/goldenseal-benefits-and-side-effects/, last accessed June 12, 2017.